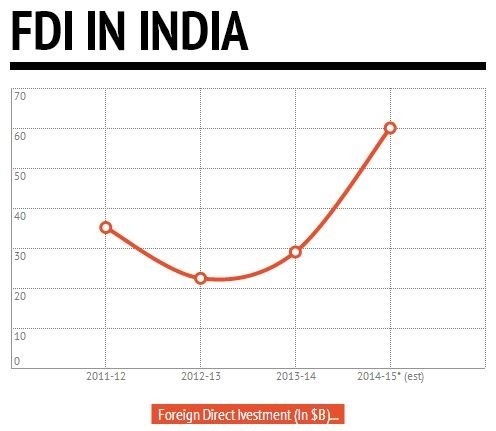 The Associated Chamber of Commerce and Industry in India (ASSOCHAM) has just released a financial report which states that foreign direct investment or FDI is all set to double this fiscal year, owning to the euphoria generated by Modi’s new government. Narendra Modi will take oath as India’s new Prime Minister today afternoon. Last fiscal year, that is 2013-14, total of $29 billion of FDI came into India, which will swell to $60 billion by the end of this fiscal year, as per the report. The promises of large scale economical decisions and the blueprint of the revival of Indian business and commerce in the coming months is luring foreign investors into Indian market, and prompting them to invest more resources. ASSOCHAM study predicts that this 100% increase of FDI this fiscal year speaks volume about the optimism and hope which the new government has successfully induced into the Indian business and corporate world. As per this study, it is expected that the prices of commodities will decrease and the interest rate will ease up, which will trigger further growth as these were the two biggest obstacle faced by the Indian economy. In coming months, it is expected that FDI will exponentially increase in the infrastructure led investment areas such as airports, sea-ports, roads, energy and oil & gas. Interestingly, such strong market sentiments and inflow of foreign funds into the Indian market will pose a significant challenge to the RBI as the position of Indian Rupee against Dollar is strengthening, thereby hurting our exporters. Last week, the value of dollar against rupees was Rs 58.60, which is by the strongest in several months. This has led to buying to dollars, which means there is less dollars in the market, which is again troubling the RBI. One thing is quite sure: the euphoria and the hope which Modi government has generated after Lok Sabha elections should be used in a constructive manner, thereby improving and strengthening the Indian economy.